La Nécropole Nationale du Natus is a memorial located just off a winding forest road to the south of La Teste-de-Buch, by the Bassin d'Arcachon. It offers a poignant reminder of one of the saddest chapters in the history of the First World War: the lives and deaths of hundreds of soldiers at the Camp du Courneau military base. In 1914, with war raging in Europe, France made the decision to seek reinforcements from overseas, most notably from Senegal, a French colony at that time. Two transit camps were set up away from the frontlines to welcome, train, organise and rest these extra "tirailleurs sénégalais" (Senegalese infantrymen). One was in Fréjus on the Mediterranean coast, the other was Camp du Courneau, on a parcel of newly-irrigated marshland where rice used to be cultivated between La Teste and Cazaux. 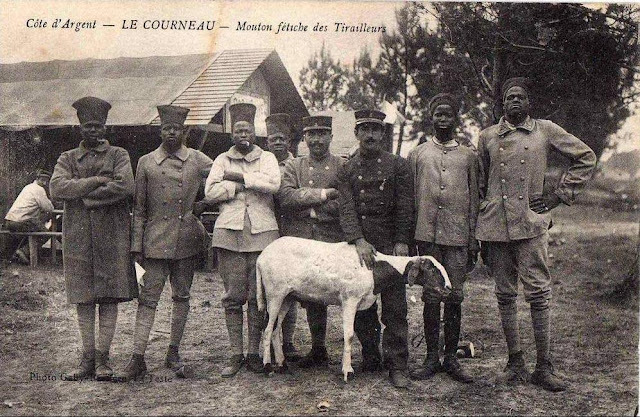 From April 1916 until July 1917, the camp accommodated an estimated 27,000 (some say up to 40,000) Senegalese infantrymen who had arrived by boat in Bordeaux before being ferried by rail to Courneau. The conditions were rudimentary though and the poor hygiene contributed to the loss of 940 soldiers – in other words, 940 victims of war who succumbed to illness rather than enemy fire on the frontline. Senegalese soldiers on Rue du Port in La Teste (source: La Teste-de-Buch à travers les siècles). The final stop for many Senegalese troops. On the camp, up to 60 men would squeeze into one of the 400 barracks which measured 6 by 30 metres. The shelters were not waterproof for long and rainwater would seep through into the dwellings. Small stove heaters offered little warmth for the troops who found it hard to adjust to the European climate and damp terrain. Laundry was washed in the canal that ran between Cazaux and the Bassin d’Arcachon. The only electrical power available was in the hospital tent. In front of the barracks (source: La Teste-de-Buch à travers les siècles). 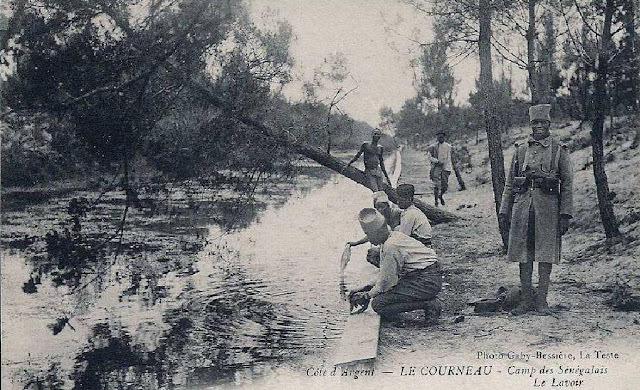 Washing clothes in the canal (source: arcachon-nostalgie.com). Despite methodical daily cleaning procedures, the cramped living quarters and aforementioned conditions meant that illness spread like wildfire, with most of the deaths of the Senegalese being caused by lobar pneumonia (although it is believed that the bacteria had been brought over from Africa). From June 1916 onwards, the bodies were buried in a mass grave and later transferred one kilometre, forming a mound in a place known as Le Natus. To this day, the necropolis and memorial form one of the most harrowing sites/sights in the region. In 1917, subsequent to the departure of the Senegalese (those who were still alive had bee n sent to fight in the Battle of Chemin des Dames), the camp became home to Russian troops who had been committed to the French front. 16,000 Russian troops were sent to France but many rebelled. Around 6,500 of the reluctant soldiers eventually ended up at Courneau around the time of the October Revolution in their home country. On the camp, a laissez-faire atmosphere reportedly reigned; many of the men devoted much of their time to alcohol-fuelled outings to Bordeaux and Arcachon. Twelve Russians died at Courneau and they too are buried at the Natus site. La Teste-de-Buch à travers les siècles).. In January 1918, the camp was transferred to US forces, who had joined allied operations six months earlier. They demanded the departure of the Russians and set about improving conditions on the site, which became known as Camp Hunt and was mainly used for artillery practice by the 165th then 161st Field Artillery brigades. The Americans (of whom there were almost 16,000 in all) were reportedly popular with locals. One soldier, Jerry Pearce, even ended up marrying a Bordeaux girl and descendants remained in the area. They too lost a number of men through accidents and illness. 87 bodies were buried on a plot of land just yards away from the Natus grave of the Senegalese and Russian troops. After the Second World War, the remains of those US troops were transferred either back to the States or to the American military cemetery in Suresnes near Paris. The memorial remains. 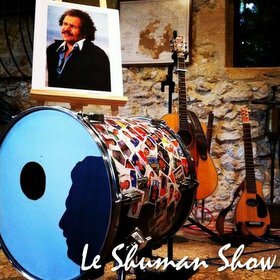 While there is no way a humble blog item could possibly do justice to such a vast topic, former top rugby player (and now Doctor) Serge Simon went much further by filming “Une pensée du Courneau”, a revealing documentary broadcast by France 3 Aquitaine in November 2011. When researching the subject, he uncovered unsettling evidence of experiments which had been carried out on the Senegalese, "who were relegated to the state of human guinea pigs". One Dr Joseph Kérandel, affiliated with Institut Pasteur in Paris, had been drafted into the camp to eradicate the lobar pneumonia epidemic sweeping through the troops. Though incurable in these pre-antibiotic times, it was hoped the illness could at least be prevented and Kérandel developed a vaccine in under four weeks. The product, which had not been tested on animals, was widely administered to Senegalese soldiers and results were monitored and documented with a view to subsequent capitalisation and more extensive deployment of the vaccine. In research carried out since this Invisible Bordeaux article was originally published, writer Eric Joly has however established that the vaccine was derived from a formula used with success on miners in South Africa. Was Kérandel's dismissal therefore misguided? Tall fences surround the former camp. Either way, the Nautus memorial offers a disturbing reminder of this painful heritage. There are still a few remnants of the camp itself, with visits very occasionally being organised in agreement with the local military (the zone is part of a wider military base that encompasses an area twice the size of Paris). Most of the time though it is hidden deep in the forest behind tall impenetrable fences, out of sight... but it is our collective duty to ensure that what happened there is never out of mind. 2018 centenary update: on November 10th 2018, after years of painstaking research by local historian Jean-Pierre Caule and the ONAC (Office National des Anciens Combattants), plaques featuring the names of the Senegalese soldiers were unveiled. 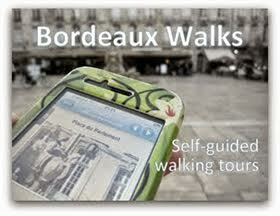 This week saw the launch of the first spin-off of the Invisible Bordeaux project: a set of guided walking tours that are available to download and run on iPhones, iPads and other iDevices that may or may not yet exist. The tours aim to provide visitors (and locals!) with interesting itineraries through the city that take in a host of sights of architectural, historical and cultural significance. As well as written word, the guides feature full audio commentary and original photography. Deep in the elegant Ville d’Hiver district of Arcachon sits a quiet square: Place Fleming (originally Place des Palmiers). Landmarks include its bandstand and a church that, since 1974, has belonged to the Église Réformée de France movement. However, the chapel was originally an Anglican church built to serve Arcachon’s British community and founded in 1878 by one Reverend Samuel Radcliff.